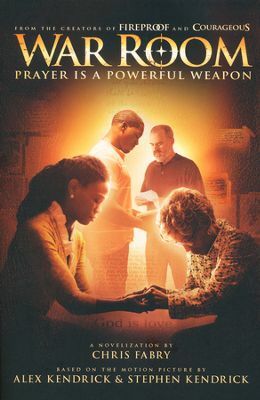 War Room by Chris Fabry will motivate you to go beyond talking about praying, it will move you to do the praying. Oftentimes, a book will be so far from the movie version that it is frustrating to the reader but not so with War Room. It is done very well in keeping with the context of the movie. If you’ve not seen the movie and read the book, you will not be missing out, if you’ve read the book and not seen the movie, you will not be missing out but friend, if you can do both, DO IT and you will be blessed twice as much. I love the characters in War Room. Ms. Clara is a woman wise in years and age and a powerful prayer warrior. She takes her position of approaching the throne with boldness to a whole new level and she’s one that you can’t help but fall in love with. She’s figured out that being cordial and polite is allowing too many to become wimps, so she’s bold in her approach yet loving at the same time. Elizabeth and Tony have everything that looks good on the outside but what they’re lacking is a marriage that is loving and godly. In their attempt to be successful, they have forgotten the innocent causality of war, their daughter. Both have learned to adapt to the world they’ve created and fighting is their only way of communicating. When Elizabeth meets Ms. Clara, she finds that there is another way and she longs for it. Tony is used to being the best, doing the best and having the best. He has allowed ambition to override his good judgment and it may cost him everything. Elizabeth goes into her war room and does the right kind of fighting. She learns that God is all powerful and that she has been blinded, fighting the wrong enemy for far too long. I cannot say enough good about War Room. It’s amazing, powerful, moving and invigorating. It had me crying, laughing and ready to enter my own war room. It’s not only a must read it’s a must share with everyone you know. I highly recommend War Room! I received an Advanced Reader Copy of this book from Edelweiss and Tyndale Publishing in exchange for my honest review which I’ve provided here.